Spring produce is at its peak! This month I’m loving the spring asparagus, last of the mulberries and the joy of perfectly ripe, just-picked strawberries from my garden. I’ve been making wild soda from berries and herbs in my garden. I was a little skeptical that wild yeast in the air could create a bottle of fizz, but it really does! 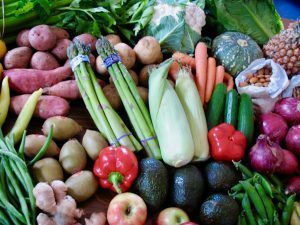 Enjoy the super-fresh: Asian greens, asparagus, avocados, bananas, beans, berries, cherries, chillies, corn, cucumber, grapefruit, lettuce, mangoes, melons, onions, oranges, passionfruit, peas, pineapple, silverbeet, tomatoes, zucchini. What to cook with asparagus? Simply tossed in olive oil and roasted in a hot oven for 10 – 15 minutes.